WyeSoft Chess is an online chess game that allows you to play against anyone in the world. It supports both live games (where you make your moves quickly) and long games (where you might only move once every few hours, days or even weeks). You do not need to stay logged into WyeSoft Chess for your games to continue - you only need to log in to move if you wish, although if you stay logged in you will be able to tell when it's your move in a game or if someone has requested a new game with you. Other features supported by WyeSoft Chess include the option of receiving e-mails or even SMS to alert you when it's your move, a chess bot to challenge, and the ability to play some chess variants as well as standard chess. 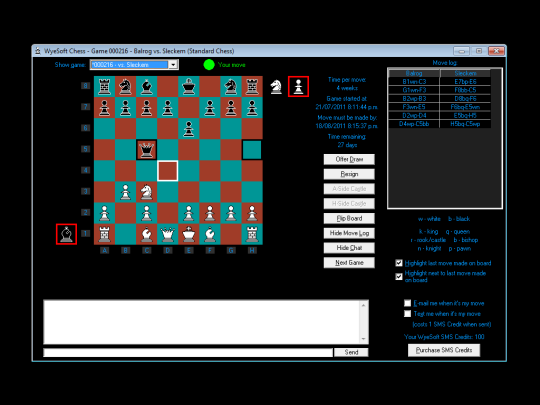 The variants currently available to play are Chess960, Upside-Down Chess, Pawns Game and Weak. There is also a web-based version available for those who do not want to download the application version.